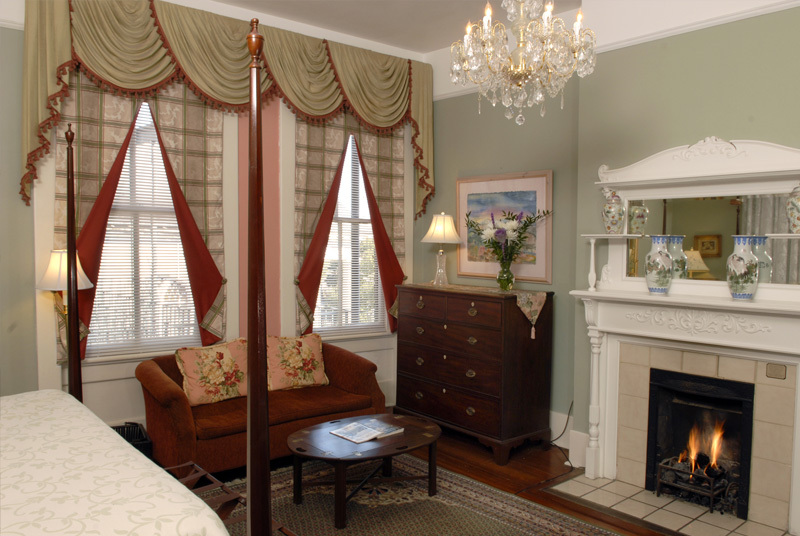 This deluxe Savannah Georgia Bed Breakfast room is directly on the parlor level. This over-sized room has an exceptional view of one of the oldest churches in Savannah. In addition to a private bath, 32 inch flat screen HD television, king size bed, there is a full size antique writing desk. As a result makes this deluxe Savannah Georgia bed breakfast room a showplace. Furthermore a working fireplace that is easily viewed while relaxing in bed with a glass of wine. Consequently you can expect to relax. Click on the image for a larger view. Straight out of the Eighteen Hundreds, this over-sized room with a walk-in closet features an English King four poster mahogany king bed and most noteworthy a backdrop canopy. The sitting area in front of the mirrored working fireplace features a sofa for two since this is our most romantic room. 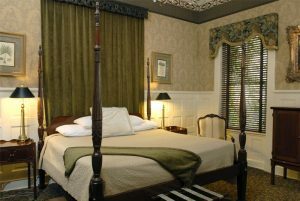 This deluxe Savannah Georgia bed breakfast room has a wall of windows overlooking the tallest church steeple in Savannah and our garden courtyard. Accented with a French carved mirror, 32 inch flat screen HD television, Chinese armoire in addition to a private bath, and oriental carpeting. 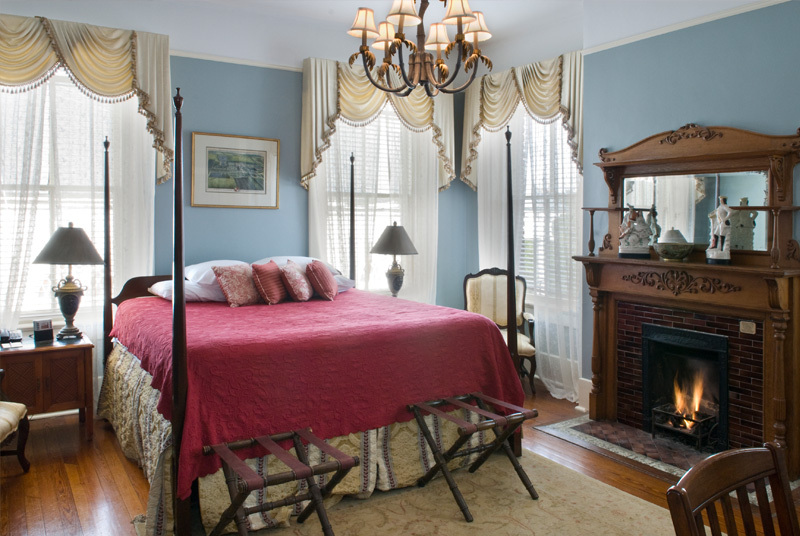 Click on the image for a larger view of this room in this deluxe Savannah Georgia Bed and Breakfast. 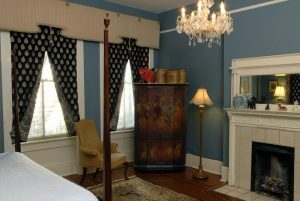 Done in historic colors with custom matching window treatments to cover the walls of windows on two sides of this quiet corner room. 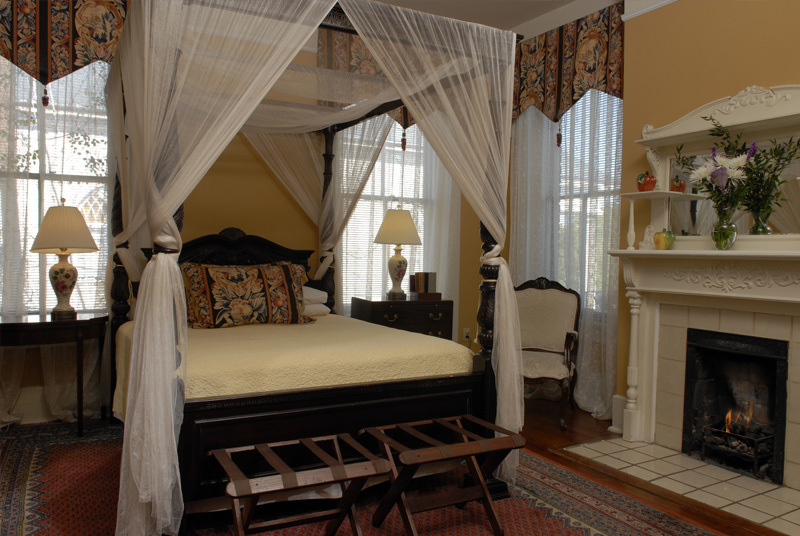 This deluxe Savannah Georgia bed breakfast room overlooks the famous Bull street and the Independent Presbyterian Church, the star of the show is the hand carved queen canopy ebony. Elegant yet comfortable. The room also features a private bath, original art, an antique white-mirrored working fireplace, coordinated oriental carpeting, and a sitting area with leather club chairs. As a result, relaxation ensues. Click on the image for a larger view. Checking into the Nottingham is like entering a fine London hotel. 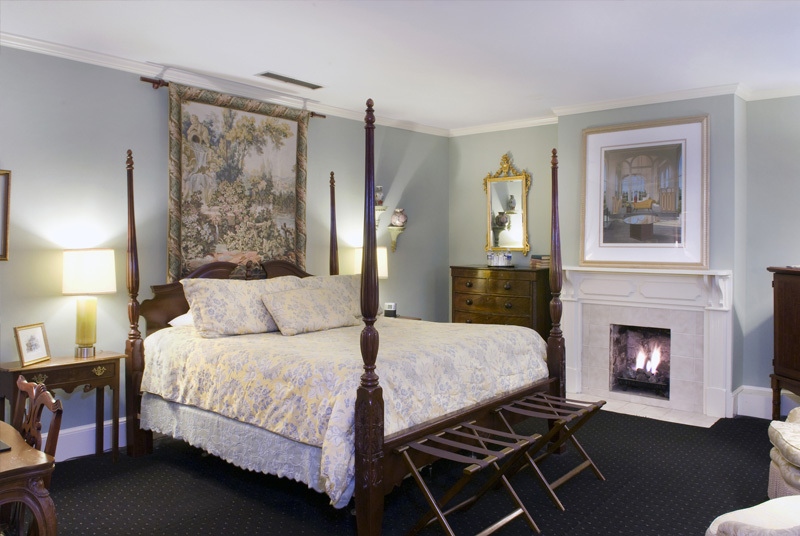 A King size four-poster king rice bed, backed by an English countryside mural, dominates this Savannah Georgia bed breakfast room. Therefore the eye travels to the working white antique marble working fireplace and to the comfortable sitting area featuring two silk English bedroom chairs and a small antique writing desk and a 32 inch flat screen HD television. A private bath, French carved mirror and most noteworthy limited edition prints add ambiance. Also there is a window overlooking the grotto courtyard of this deluxe Savannah Georgia Bed Breakfast. Click on the image for a larger view. 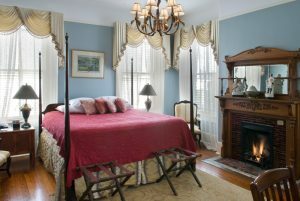 A very proper over-sized English room with private bath, period furniture, 32 inch flat screen HD television, a walk-in closet; done in pale greens with an ivory-mirrored working fireplace dominate this deluxe Savannah Georgia bed breakfast room. Six-foot oversize windows overlooking the steeple of the Independent Presbyterian Church and our garden courtyard. Coordinated historic window and carpeting give this room a distinctly sedate feel. As a result you will want to sit by the fire with some evening port. Click on the image for a larger view. 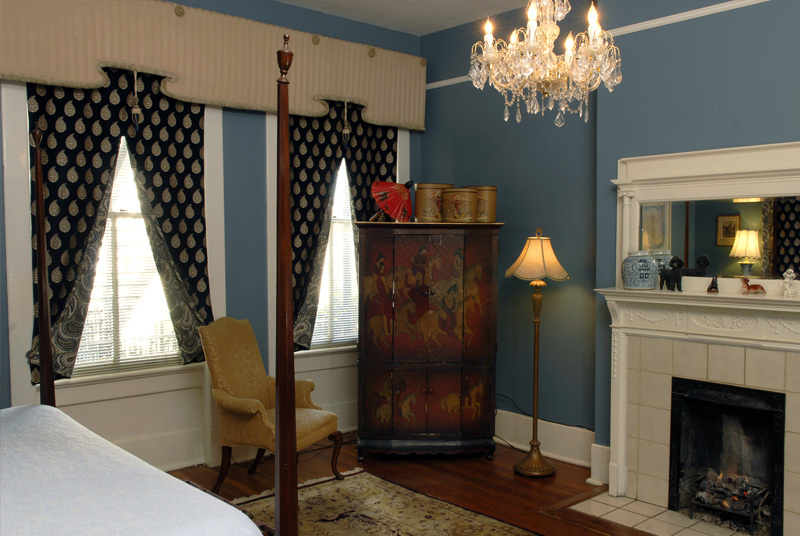 This king size corner room is done in historic blues, with hardwood floors, two walls of windows overlooking our courtyard, Bull street and the tallest church steeple in Savannah, magnificently lit at night while not disturbing the peacefulness of the room. This deluxe Savannah Georgia bed breakfast room features a private bath in addition to a 42 inch flat screen HD television, mirrored antique working fireplace, an English mahogany armoire and original art. A wonderful place to wake for your deluxe Savannah Georgia bed breakfast experience. Click on the photo for a larger view.